The carrier that has been used more than any other in my collection is our trusty Galaxy Grey Ergo. I purchased this new in 2011 and began using it nearly daily when my son was around 4 months old. At the time, I did not have much to compare it to. I loved the versatility of this carrier. The front and back options were so handy. My son and I would snuggle with him cozy on my front while running errands or enjoying nature walks. I would put him on my back to make supper or do my chores around the house. I also loved the pocket and the hood on this carrier. The pocket zips, keeping a diaper, keys and cellphone safe. The hood snaps in place easily, and is not removable from the carrier, but rolls easily in place. I purchased the rain and weather covers for the Ergo and loved them through our cold, Canadian winters. I would strap the covers on the carrier, and strap the carrier on myself and my bundled up baby, and we walked all over on our first winter together. I mostly wore him on my front during the winter, as I found it difficult to get the Ergo on over my coat on my back. I used this carrier until my first son was around 16 months old. At that time, he was 28lbs and I found front wearing to be uncomfortable, as the sternum strap often dug in to my back or neck. I still wore him for outings, just not for the hours at a time I had previously. When my second baby was small I purchased the infant insert. I strongly disliked the insert, as it felt bulky and cumbersome. I found it difficult to adjust him comfortably in the carrier until around four months old due to this. 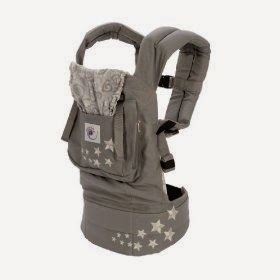 This carrier was a true favourite of ours, and it is still in my collection today. Pros: Readily available at many stores, and can often be found on sale. Versatile, and can fit both small and large babies. Cons: Though it says it can last until 35lbs, I did not find it comfortable for long-term wearing of babies heavier than 25lbs. Recommendation: I would recommend this carrier for families who are new to babywearing, and are looking for a simple and affordable soft structured carrier. NOTE: There are fake versions of this carrier, and you should always buy from a reputable retailer to be sure your carrier is authentic.